Climate alarmists have put enormous pressure on the western media to suppress knowledge of facts inconvenient to their scientific arguments using a variety of methods to supress dissenting opinion. Besides threatening journalists, promoting the use of Nazi-esque insults like the word "deniers," and bullying scientists who publish research papers critical of their near-religious beliefs, alarmists have taken to the web with aplomb, most famously exposed in the ongoing "ClimateGate" scandal. Engaging in politicized science via email isn't the only cyber activity that left-enviro activists engage in however. 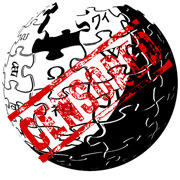 Wikipedia is also a favorite target, particularly for a British global warming activist named William Connolley who seems to have made it his life's mission to censor climate realists in the online encyclopedia. Connolley claims he is employed currently as a software developer and has not disclosed that he is paid to engage in wiki enviro-activism. Considering that most of his wiki contributions seem to happen outside of business hours GMT, it seems likely that Connolley is interacting with Wikipedia on his personal time. Climate alarmism seems to have become a personal obsession for him, however. Just this past Thursday, the UK Green Party politician made 31 comments or revisions to articles according to his user contributions page. In the month of August 2009 (one which I picked randomly), Connolley had a total of 451 edits or comments, averaging out to 15 every day of the month. That, mind you, is with a two-week hiatus of August 15th through 24th where Connolley made no edits factored in. During June of 2009, Connolley literally could not take a break from Wikipedia, making a whopping total of 815 contributions to the site spread over every day of the month, an average of 27 each day. Starting in February 2003, just when opposition to the claims of the band members were beginning to gel, Connolley set to work on the Wikipedia site. He rewrote Wikipedia's articles on global warming, on the greenhouse effect, on the instrumental temperature record, on the urban heat island, on climate models, on global cooling. On Feb. 14, he began to erase the Little Ice Age; on Aug.11, the Medieval Warm Period. In October, he turned his attention to the hockey stick graph. He rewrote articles on the politics of global warming and on the scientists who were skeptical of the band. Richard Lindzen and Fred Singer, two of the world's most distinguished climate scientists, were among his early targets, followed by others that the band especially hated, such as Willie Soon and Sallie Baliunas of the Harvard-Smithsonian Center for Astrophysics, authorities on the Medieval Warm Period. All told, Connolley created or rewrote 5,428 unique Wikipedia articles. His control over Wikipedia was greater still, however, through the role he obtained at Wikipedia as a website administrator, which allowed him to act with virtual impunity. When Connolley didn't like the subject of a certain article, he removed it - more than 500 articles of various descriptions disappeared at his hand. When he disapproved of the arguments that others were making, he often had them barred - over 2,000 Wikipedia contributors who ran afoul of him found themselves blocked from making further contributions. Acolytes whose writing conformed to Connolley's global warming views, in contrast, were rewarded with Wikipedia's blessings. In these ways, Connolley turned Wikipedia into the missionary wing of the global warming movement. Incidentally, Connolley is currently up for election as a Wikipedia administrator. If you are a registered user, you can cast your ballot against his left-wing propaganda campaign here. Such a horrendously biased an obsessed individual should not be allowed to decide what is neutral or fair, the ostensible guiding principle of Wikipedia.